This Roku HD Streaming Player has a built in wifi that will allow you to stream from your computer directly to your TV. Works with almost every TV. Also comes with a $5 amazon Instant video credit and super free shipping. 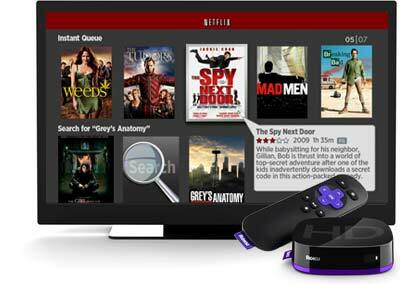 Roku HD streams 600+ channels to any TV easily and wirelessly, all at an amazing price. Features 720p HD video quality and one-stop search. 600+ channels and growing. Movies and TV shows from Netflix, Amazon Instant Video, Hulu Plus, VUDU and HBO GO, plus live sports, music, news, international, and more, up to 720p HD. Free movies! Includes hundreds of full-length Hollywood movies and TV series from Crackle—all free and on-demand. Best selection of live sports. Featuring MLB baseball, NHL hockey, NBA basketball, MLS soccer and more. One-stop search. Find your favorite movies and TV shows all from one place—no matter if they’re on Netflix, Amazon Instant Video or Hulu Plus. The easiest setup. Works with virtually any TV, includes built-in wireless, and sets up in minutes. Free iOS and Android app. Use it like a remote. Browse and add new channels. Even stream your music and photos from your phone or tablet to your HDTV. Of course, there are also tons of international and lifestyle programming, tech news, social networking, podcasts, cartoons, clips, cat tricks, and… well, you get the idea. 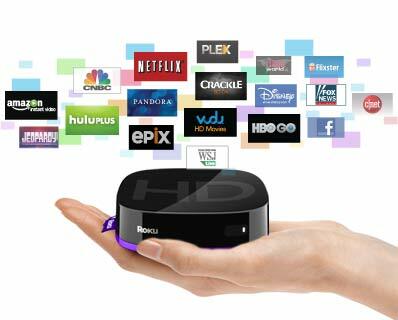 The Roku HD delivers all the streaming entertainment choices, 720p HD video quality, and ease-of-use that Roku is known for, at an amazing price. Enjoy 600+ channels from all the top sources such as Netflix, Hulu Plus, Amazon Instant Video, Pandora, HBO GO and MLB. Includes one-stop search. There’s even a free app for iOS and Android.